STATEN ISLAND, N.Y. -- Richmond County Public Administrator Gary D. Gotlin was among those gathered behind nine small white coffins last week at the Garden of Angels, a plot reserved for stillborns at Resurrection Cemetery in Pleasant Plains. The public administrator assumes responsibility for stillborn babies after mothers waive their parental claims, which was the case with the nine buried Friday by Gotlin, the Rev. 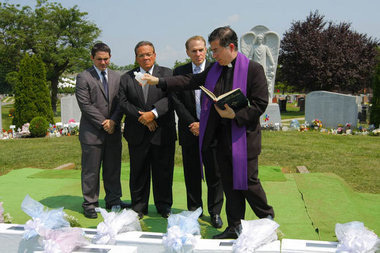 Frank Pavone, the director of Priests for Life, and John V. Scalia of the Scalia Home for Funerals in Eltingville. "I just have this very strong sense that something has to be done. I won't accept the alternatives," Gotlin said, noting that abandoned stillborns from other parts of the city are almost exclusively buried at the potter's field on Hart Island, the city's municipal burial ground near the Bronx -- where 700,000 stillborns are buried -- used for medical science or considered medical waste. "I have a policy in the office that we will bury all stillborns. We will find a way," he asserted. Gotlin said Scalia donated the hearse, coffins and flowers used Friday and played a critical role in arranging for the nine burials. "Mr. Scalia is one of the most generous, caring people I've ever seen in my entire life," Gotlin said. Scalia called his connection to the stillborn youth a "personal" one, recalling his brother and sister-in-law, who had a stillborn child in the 1970s. "I decided that particular day that I would never charge for a child, and we don't charge for children up to 12 years old," Scalia said. Father Pavone, whose national organization is based in New Dorp, led a service for the nine children. "These are real people. This was a real death. This was a real loss. Whether or not the parents were able to be involved, this child is just like the rest of us -- equal in human dignity," he said. Gotlin stressed that he had no political agenda in burying the nine stillborns. "This is not about that," he said. "This [is] about that these children should not be in [a] potter's field, nor in medical science. They should be here. That's my only issue." He said he tries to respect the religious faiths of a stillborn's parents. "That's really very important," Gotlin said. "That's one of the first things I ask: 'What was the religion of the person who passed away?'" The nine stillborns buried Friday all had Christian or Catholic parents. Gotlin said he works with the Free Hebrew Burial Society, which donates burials for Jewish children, to bury Jewish stillborns whose parents waive their rights. Funding for the burials was provided in part by City Councilman James Oddo, who was unable to attend but sent a proxy. Jeannie Frey, an advocate with the Miss Foundation, a not-for-profit organization favoring rights for abandoned stillborn babies, said providing dignified burials is important. A resident of Bellmore, L.I., Ms. Frey has been a statewide champion of reform, promoting legislation passed in September 2011 that provides special birth and death certificates for stillborn babies. She, too, was motivated by personal tragedy. "I would have had a sister two years older than I," Ms. Frey said. "I didn't find out about it until I was in my 30s, when I found a little dress -- a baby dress -- in the basement and brought it up to my mother, and she started crying." New York state's stillbirth certificate law, called the Missing Angels Law, was the 32nd of its kind in the nation. Ms. Frey called it significant because it "actually documents that these children existed." Representatives of Richmond University Medical Center in West Brighton were also present at Friday's service. Robert Aulicino, the hospital's vice president for ancillary and ambulatory services, said, "From a professional and administrative perspective, this is a tremendous dilemma for us." He explained that the parents of the nine stillborns buried were given three months to reverse their decision to sign release papers. "We contact them again to make sure they're comfortable with the decision they've made, and at that point it becomes our responsibility," Aulicino said. Gotlin said although these types of burials were "outside the normal mandate of our office," he would continue to pursue proper burials for stillborns and would advocate the practice to other public administrators in New York. "I speak for those who can't speak," Gotlin said. "I say to myself, 'If I was this person unable to speak, what would I want done with my remains?' My answer ... would be a dignified burial."